About this book : This is a book that aims at helping those who know how to read and speak arabic letters ( letters only and not arabic as a full language) to understand wordings, and scenarios used in daily lives for those living in the arab world especially Khaleej. This is similar to Arabi bayna yadayk book but the Indo pak version of it. This book does not go into in-depth grammar nor does it go into unnecessary or detailed arabic analysis. This is a book that aims to teach you daily life arabic with a little grammar necessary to avoid making a fool of ourselves in public. There are umpteen arabic teaching courses and tutorials and ebooks and videos out there. Even in animation. But had this one by Shaykh Anwar shah not been beneficial i wouldn't have uploaded it nor shared it . One important thing to notice is that merely hearing won't suffice. it may give you 70% of the juice but the remaining 30% is when you hear along with reading the pdf of it. So do it together. I will keep uploading the remaining bit by bit and not all together. As of now i am only uploading bit by bit Lessons from volume 2. There are more than 23+ lessons. Note : I have received both the permission and the audios from my shaykh anwar shah to upload these for the benefit of the general masses. My intention was to translate much of this into English but time couldn’t permit that for not. Please note that the Lesson Number and Lesson name mentioned below are in accordance to the pdf file . Likewise the page no. of every lesson is also in accordance to the pdf file. اس کتاب کا مقصد ان لوگوں کی رہنمائی کرنا ہے جو عربی کے حروف تہجی لکھنا پڑھنا جانتے ہیں (صرف حروف، عربى زبان نهيں ) الفاطوں اور روز مره كے معاملات کو سمجھانا خاص طور پر عرب ممالک کے رہائشیوں کے لیے. یہ کتاب "عربی بین یدیک" کا ہم مثل ہے يا اسكا بر صغیر والا نسخہ. یہ کتاب عربی گرامر اور غیرضروری عربی تجزیے سے خالی ہے. اس کتاب کا نصب العین عربی مع ضروری گرامر سکھانا ہے تاکہ بولتے وقت آپکی غلطی آپکو شرمندہ نا کرے. آج کل کافی آنلائن کورسز، کتابیں، وڈیوز وغیرہ مل جاتی ہیں مگر اگر یہ کتاب حد درجہ کی مفید نا ہوتی تو میں نا ڈالتا. ایک اہم بات یہ ہے کے صرف سننا فائدہ نہیں دے گا. ستر فیصد سننے سے اور باقی تیس فیصد پڑھ کے، تو اسکو ساتھ کیجئے. میں تدریجیا ڈالتا رہوں گا. .
نوٹ: مجھےان چیزوں کو عام لوگوں کے فائدے کےلئے ڈالنے کی اپنے شیخ سید انور شاہ راشدی سے دونوں اجازت اور آوڈیوز مل گئ ہیں. 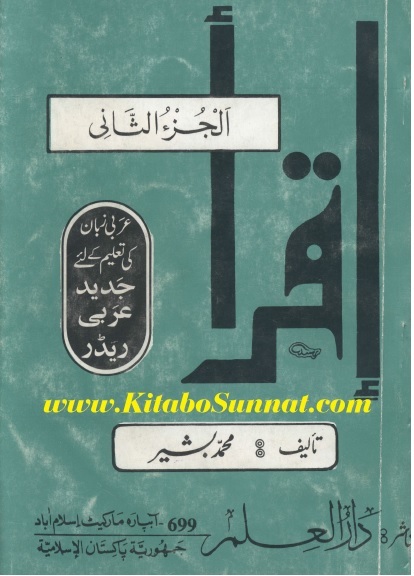 درس کا نمبر اور نام، صفحہ نمبر پی ڈی ایف (pdf) کے مطابق ہے.